Granada is a city of travellers. Hippies stroll through town barefoot with long swaying dreadlocks; buskers strum on street corners. The squares and dry brown parks are filled with young people playing drums, reading books, or drinking sangria. This is a meeting point, geographically close to the point where Europe almost touches Africa, but culturally closer still. The Alhambra, Spain’s most visited tourist attraction, rises over the city, a reminder of Andalusia’s Moorish history. Spanish, Arabic and Roma “gypsy” cultures mingle in the architecture, the flamenco, Spanish pop and traditional Berber music carried on the wind; scents of warm spices and incense piled high outside Moroccan shops, the strong sugary mint tea that wafts from terterias. This seems the perfect place for these two weary hitchhikers to rest their thumbs a while. We set about finding a flat to live in for at least six months. “Can I see it?” I ask. Sí, claro. She agrees to meet us the following day. It’s a small but cozy flat, just a few minutes walk outside the city centre, close to the hippy end of town. In the smaller of the two bedrooms, we find a white metal ladder climbing over the double bed to reach a private roof terrace. I glance at Hrach, who raises his eyebrows slightly. I know we have the same thought: Try not to seem too eager. It isn’t easy reaching a deal in a language you’re not comfortable in, especially when it transpires that there is no fixed price, and that bargaining is expected. But this lady is really nice, she drops the price herself at the last minute when we say we’re going to think about it. We move in the very next day. I had wanted to live somewhere in Spain for a while to work on my Spanish. I’d heard of Granada many times from other travellers—always somewhere I planned on heading to sooner or later, but never quite getting around to it. I wanted to live somewhere I had never seen before. For me, the process of getting to know a place is something special, and Granada already seems like it’s going to become one of my favourites. Five minutes from our new flat is Calle Elvira, a twist of cobblestones lined with Moroccan shisha bars, Syrian restaurants, and shops selling the ubiquitous flamboyant baggy trousers. Aromas of spices, mint tea and a pungent smell of ganga intertwine. Hrach takes to calling it “the naughty neighborhood”. Everyone here has a story you could write a book about. This is where, within days of arrival, I bump into a friend from Scotland, three friends from Brighton, and a girl I stayed with in Greece. We meet the other hitchhiker from the service station in Tarragona, and a couple who remember hitchhiking past us on the outskirts of Barcelona. It seems everyone is coming to Granada. 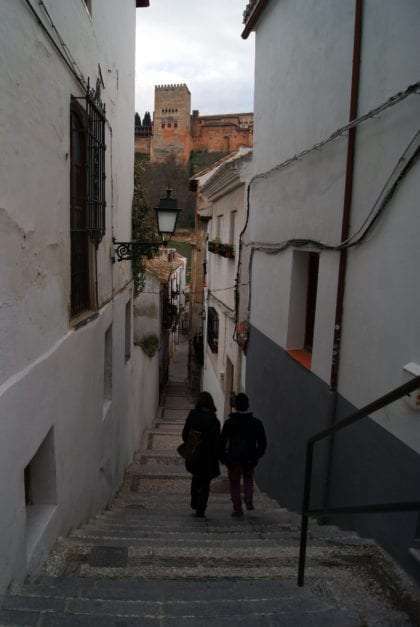 The streets of the Albaicín climb the edge of the city to Granada’s highest point. Here there are cave houses carved into the hillside, many inhabited for centuries. Many of Granada’s Roma “gypsy” community live in this area, considered the home of Flamenco music and dance. Aside from the Roma, there are a lot of “new age” hippies from around Europe, and a large Baye Fall community—a Senegalese Islamic Sufi order who are often mistaken for Rastafarians with their large flat “locks”, colourful robes and large, striking beaded jewelery. One day, a friend and I are drinking tea with a couple of Baye Fall guys outside their cave, on the hill opposite the Alhambra. We’re discussing borders and movements and people. One man asks how long I “carry” in Granada, the Spanish phrase to mean how much time you have been in a place. I tell him only a few months, but that I like the city very much. I tell him I especially like the mix of cultures here. He nods slowly. “Yes, there are many cultures here,” he tells me in a Spanish far more fluent than my own, “But they are all separate, they do not mix.” I ponder this, sipping the strong mint tea his friend has brewed for us. I realise it’s true. Granada’s Chinese community typically open bargain stores; Syrians have restaurants and Moroccans have clothes shops and terterias, serving hot sweet tea and scented hookah pipes. The Senegalese and other Sub-Saharans are mostly visible selling knick-knacks, clothes, handbags and sunglasses, which they often carry around tables outside bars. There are also a few South American women who I often see begging or selling cheaper things like packets of tissues. There are British immigrants and of course many Spanish people—often students from different cities. It’s not so often you see these communities mixing. Our friend tells us how black Africans living in Granada are stopped by police on an almost daily basis, often beaten for no reason—something close friends of mine have already witnessed—and arbitrarily detained. “The border is everywhere,” he says. My time in Granada is largely spent staring at my laptop screen, teaching English and writing my book, a female hitchhikers handbook. 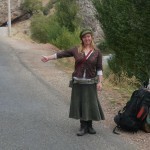 Several of the women I’ve been interviewing have hitchhiked solo through parts of, or right across, Africa. In almost every African country they have been welcomed warmly, given food and a place to stay for free and without hesitation. In many cases they have been invited into people’s homes and hearts and treated like a long-lost family member. I’m struck by the contrast of these experiences with what many Africans face in Europe. Granada’s Senegalese Baye Fall community have an open zikr ritual every Thursday evening. We hear their drums rippling through the hot summer air as we hike up to the caves, huffing and panting. This hill is the highest point in the city, peering down over even the Alhambra. “How ironic”, I say to Hrach, “that the community who are the most marginalised have the best view of the city.” We amble along the dusty track past many cave houses with their hobbit doors, lights illuminating veiled windows. We find the zikr cave easily. A man gently nods a greeting as we arrive and hands us each a small plastic cup of hot sweet coffee. He gestures for us to sit on a stone bench that has recently been swept. Granada is empty in the summer and although several people take part in the ritual, a friend sitting beside me says at other times of year, the whole place is full. The Baye Fall have a high reverence for hard work, singing and dancing. Work is seen as a form of devotion that purifies the spirit. Several men, a woman and the cutest kid in the world stomp to the drums, walking in a close-knit circle around a bowl on the floor. The drums ripple through my spine making me sway like a tree in the faint hot breeze. Zikr is an Islamic word meaning remembrance of god. The stomping people sing devotional songs in Wolof, or perhaps their own tribal languages, often repeating the Arabic verse, la-ilaha-il-allah—there is no god but Allah—but in the most African way imaginable. This is something else I’ve read about the Baye Fall, that they have a truly African form of Islam and are terrifically proud of their cultural heritage. Near the door of the cave sits a light which softly illuminates the space and particularly the depictions behind it, artfully drawn shadow portraits of the Baye Fall movement’s founder and namesake, Ibrahim Fall. This is another striking difference between more mainstream Islam and the Baye Fall. In most Islamic teachings, depictions are haram. After the ritual we go to a bar with a particularly warm-hearted and bright-eyed Senegalese man, who speaks animatedly about his traditions and culture. I am beginning to feel that Africa is calling me. It might have to wait a few months.